Crop from the deep background of CVA Str P338. Sign mounted atop the Petrina Block near corner of Cordova and Cambie (north side of Cordova). ca1889. Charles S. Bailey photo. The original photo from which the above crop was made is the one featured at this recent post. I was zooming into the original shot, during the time that I was writing that post, when I noticed the sign atop the Springer-Van Bramer building (extant, but apparently known today as the Petrina block) at the corner of Cordova and Cambie. Mizony was not a name that I had previously encountered. So I jotted it down, expecting that I’d discover with a little bit of research that the name was widely known by Vancouver historians. However, as it turned out, the Mizonys were in town so briefly as to make relatively little impact on the collective Vancouver memory. So who were the Mizonys¹ of Mizony & Co. Wines, Cigars, Liquors? There are two Mizonys who have listings in early Vancouver directories: R.T. (Rene Theophile) and Artemus (who appears to have been a junior partner in the firm, and a relative, possibly a brother, to Rene; Artemus doesn’t figure in this post). Rene seems to have been a shortened form of his full first name: Irene. Rene was married to Mary and they had a son, born in Colorado, and the only one to accompany them to Vancouver: Paul (1881-1975). Rene and Mary were both born in France; They seem to have both been (along with Paul) American citizens. (Note: At some point, I presume, Mary died and Rene married again, in 1904 – this time Anna Dunn, born in Kansas). The Mizony family lived at 714 Nelson Street (near Granville). Paul was enrolled in Sacred Heart Academy (a Catholic school). An early business venture seems to have been a restaurant on Cordova Street. It is identified on an early photo showing the business block in July 1886, “five weeks after the [Great] fire”. 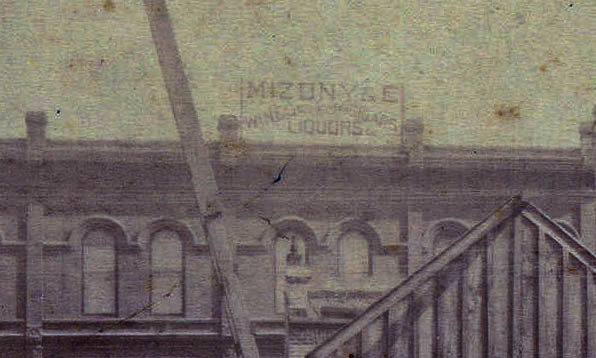 Mizony & Co. Liquors was located at 303 Cordova Street, in the Springer-Van Bramer Building (Hoffar, 1888). 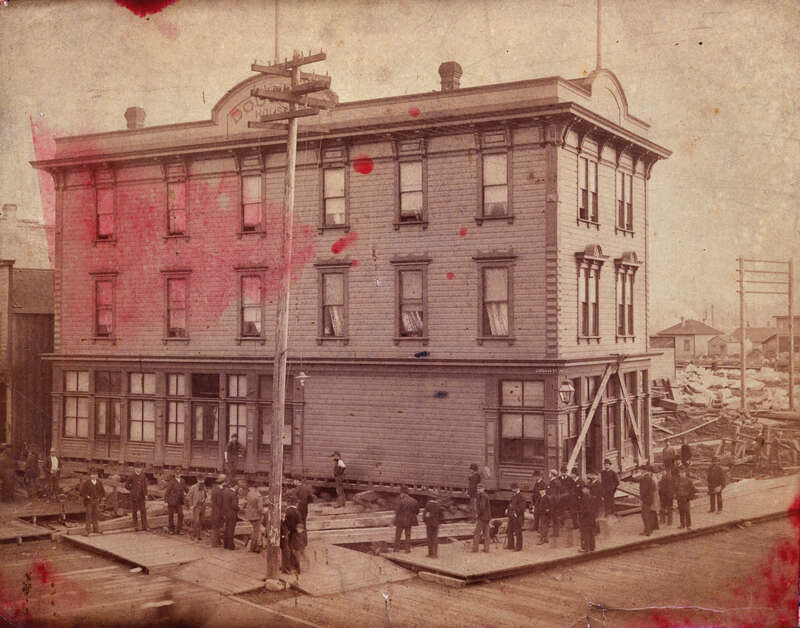 By 1891, Rene was managing Dougall House, a Hotel at SE corner of Cordova and Abbott; today it’s the building that houses the administrative hq of the Army & Navy Dept Store. 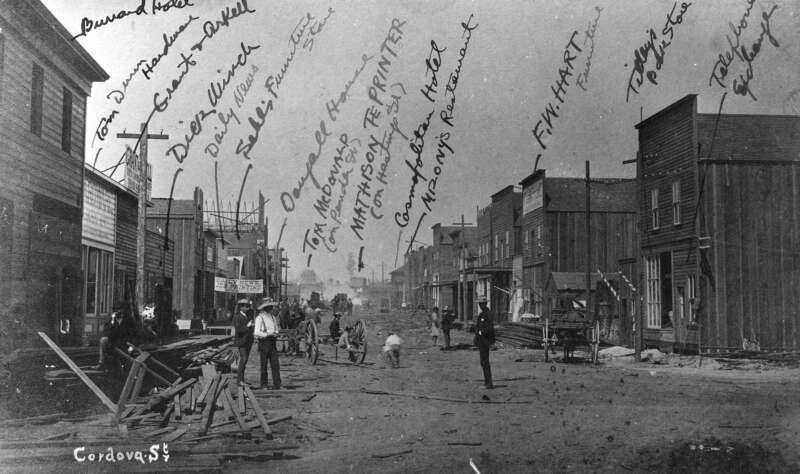 CVA – Str P7 – Cordova Street [looking west from Carrall Street] – July 1886 – five weeks after the fire. July 1886. Rene and family came to Vancouver by 1886 (Rene was here in time to be on the first city voter’s list) and left as early as 1892; by 1894 for sure, as Rene’s name was dropped from the electoral list that year, “having left the country.” The Mizonys apparently left Vancouver to return to their home base of San Diego. They later lived in the mining town of Randsburg, CA. CVA – Hot P34 – Dougall House being moved to the rear of lot on southeast corner of Cordova Street and Abbott Street. A brick structure would replace this wooden one as Dougall House; the wooden structure would become an annex behind the brick building, 1890. Bailey & Neelands photo. and found that he had just $1.75. By good fortune we met an old family friend that we had known years before, in Vancouver, B.C. He had a furniture store and gave me a job as a clerk and handy man. ¹Various spellings are recorded (e.g., Mizoney). CVA spells it “Mazoni” in one place; “Mizony” elsewhere. Family members seemed to spell it Mizony. ²A copy is available from VPL’s Special Collections department. ³This is confirmed by Vancouver Votes, 1886, p. 348: “In 1894 the Harts sold out in Vancouver and moved to Rossland. . . but during the Alaska gold rush Frank went to Dyea and invested heavily in real estate. . . . In 1908 the couple moved to Prince Rupert where the couple was again in the furniture and funeral business. . . . He died 4 May 1935 in Prince Rupert. This entry was posted in Bailey & Neelands, businesses, Uncategorized and tagged Anna Mizony, Artemus Mizony, bc, Dougall House, Dyea Alaska, Frank Hart, history, I. T. Mizony, Paul Mizony, Rene Mizony, Springer-Van Bramer building, vancouver. Bookmark the permalink. Hmm….all this from noticing a sign in an old photo….cool! 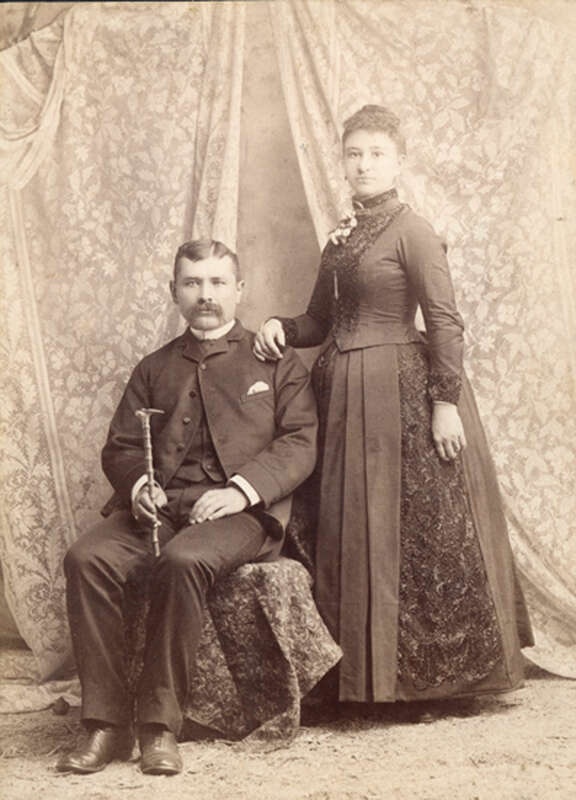 According to FamilySearch.org, Irene T. Mizony and Anna M. Dunn were married in King County, Washington, on May 11, 1904. In the 1910 US census he’s listed as I.T. Mizony, age 55, born in France; his wife is Anna, age 38, born in Kansas. They have a son, Harold I. Mizony, age 5 living with them. They were all living in Seattle. I.T. Mizony’s immigration year is given as 1882. Could Anna therefore be his second wife? PS: glad to see you’ve made good use of C.S. Bailey’s photography. Thanks for pointing this out. I expect you’re correct that Anna was Mr. M’s second wife. I have noted in Vancouver Votes that Ms M. is shown as “Mary” born c1864 in France. I’ll make the correction to the text later today. Thanks again. Also, I should have mentioned that Paul Theofile Mizony, according to his WW1 draft registration record available through FamilySearch.org, was born in Pueblo, Colorado, on 27 Feb 1881. His California death registration index entry also indicates he was born in 1881 in Colorado.